“Elephant’s toothpaste” is a wonderful illustration of the power of a catalyst to speed up a reaction. It’s also very cool, and anything that shows kids how cool science is worth doing, right? Stand back and admire the reaction! The photos say it all! We had enough hydrogen peroxide in our £2.74 bottle to have two goes. Afterwards I gave the children a bowl each to mix up the red and green foam. Hydrogen peroxide naturally breaks down over time into water and oxygen. Catalase, the enzyme in yeast, acts as a catalyst to speed up the reaction. 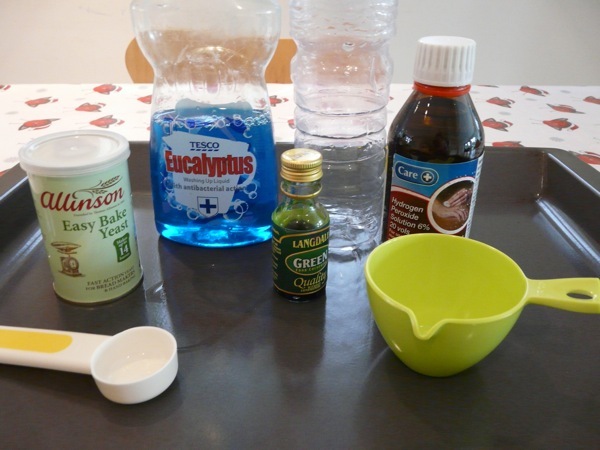 The washing-up liquid joins with the oxygen to make an abundance of foam. And – as with so many of our homeschool science projects – the food colouring just makes the whole thing look even cooler! I would point out next time that during the reaction, the bottle gets warm and steam is produced from the water, because this is an exothermic (heat-producing) reaction. I would also mention that although a catalyst speeds up a chemical reaction, it is left unchanged itself: the dissolved yeast is left in the bottle. 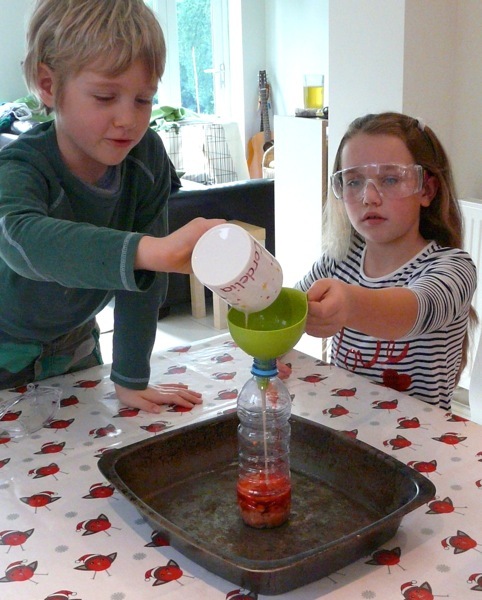 Elephant toothpaste is well set-out in our favourite Science Experiments book, but I followed the instructions I found at another mum’s blog (unfortunately her blog is no longer live). 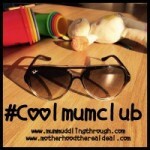 Where there’s a choice, I prefer to follow a mum’s personal experience when it comes to learning fun with kids! Do you notice our safety glasses? Not strictly necessary here, but they definitely remind us we’re Real Scientists! For more fun science ideas, visit Science Sunday at Adventures In Mommydom. So glad you finally made this. Your pictures are wonderful! Wasn’t it amazing?! And thank you a TON for linking to me. I really appreciate it!!! Thank you for coming to have a look, Erin! I just love all the blog inspiration out there, isn’t it great knowing people (like me) can be inspired to do fun stuff for as long as our words and pictures are up here in cyberspace! Thank you so much for your generous comment! Funnily enough, I put your blog in my Reader last week 🙂 Go for it with the elephant toothpaste – it was one of our favourites! We love Elephant Toothpaste, too! I’ll look out for it on your blog, Phyllis! I pin things for ages and ages too. I’ve got things pinned for school for a few years from now, so I can find it when we get to that subject. I’m glad to find out I”m not the only one. Oh, and I agree with trusting a mom’s opinion over the book. They usually add in helpful tips from experience outside of a closed environment. I have a pile of wonderful books of ideas from my mother’s kindergarten teaching days (mostly in the 70’s). It makes me so sad to see them unused as I fly to Pinterest for everything! It’s so handy, but I don’t want books to become extinct!!!! How much dish soap did you add to the bottle? I don’t think we measured – just added a squirt. Sorry not to be more precise. You could try a lower concentration? Can you get 4%? You can! Just go to Sally’s Beauty Supply and get their Salon 20 peroxide. Its about $6 for a gallon and they have it in smaller sizes. I’m so excited to try this with my 5 year old for her first science fair entry. Thank you for sharing and I’m so glad I found this. Thank you so much for stopping by, Tabatha – it’s so lovely to hear of other people having fun and learning with this experiment. I hope your little girl enjoys her first science fair! It is, isn’t it, Margaret! How much dish washing soap do you use? How about the food coloring? You didn’t mention in your ingredients. Hi Eric, Sorry I wasn’t more precise. I didn’t measure at the time, but whenever we do this I use what I would call “a few generous squirts” of dish soap, and a good few drops of food colouring. The more dish soap you use, the more bubbles you’ll get, and the more colouring you use, the more intense the colour of your ‘toothpaste’ will be. I don’t think you can go wrong really – neither the soap nor the colouring are active ingredients in the scientific reaction. Have fun, and I’d love to hear how you get on. I was wondering why this is called Elephants toothpaste? Hi Lauren, it’s a funny name, isn’t it? 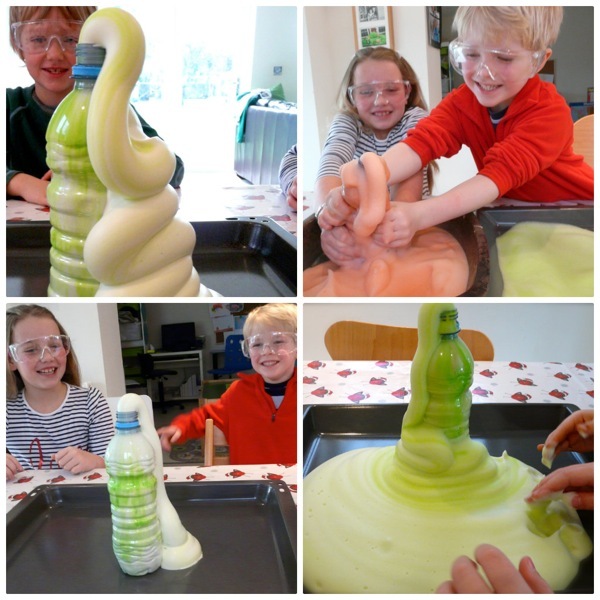 If you do the activity you might see how it came to be called ‘elephants toothpaste’. As the foamy substance comes out of the bottle it looks just like a giant-sized tube of toothpaste is being squeezed. This sounds fantastic. Just wondering will the foam be safe for little ones to play with? I would love to use it for sensory play after the experiment, just wondering if the peroxide makes it unsafe for 1 year old? Hi Claire, I think the foam’s fine to touch – my 5 year old nephew happily played with it – but I think you’d have to be a bit careful with a 1 year old because it’s probably not the best thing to eat! At this low of concentration, it is safe to touch. At higher concentrations (more than about 10% hydrogen peroxide) it should be handled only by an adult who is wearing gloves. Fun! Safety goggles are always important when experimenting. I would do this at halloween in a ceramic jack-o-lantern, the bubbles would come out of the mouth, nose and eyes. I called it the barfing pumpkin. The peroxide we can buy at the drug store is 3%. You may be able to get a stronger version at a pool slupply store, but high concentrations of peroxide can be hazardous. The bubbles are oxygen produced by the decomposition of the peroxide, the soap makes them more visible for the kids. Love chemistry! Where can I find the 6% hydrogen peroxide? I cant find it anywhere and I tried the 3% since its all they sell over the counter and its not working. My sons science fair is next week. My fault for waiting so long to actually test it out but I’m still hoping he can continue with this experiment! Hi Staci, You could try a hair salon? I’m in the UK and I bought our hydrogen peroxide from Amazon UK. I see that it is also available from Amazon.com eg here but it’s rather expensive, and you might not be able to get next-day delivery. Higher concentration hydrogen peroxide is used in hair colouring which is why I suggested trying a salon. Alternatively, the boxes of hair colour you can buy off the shelf might contain it – they probably say on the packaging? I was able to find a beauty supply store and they have it. But she suggested the 10 volume and it still didn’t work. Going back today but would you suggest the 20 volume or 30 volume? Hi again, this useful page seems to suggest that you want 20 volume. I’m sure the 30 volume would work fine too, but with kids and chemicals I always go for the weakest version that works. OK, most of what I have read also suggested the 20 volume but I didn’t want to get it and it still not be enough. But I will get that. I’d rather my son not explode these ingredients all over his classmates :). LOL. He would probably be the star of the fair if he managed that! I’m not sure what I’m doing wrong. I’ve got the 20 volume hydrogen peroxide and it still isn’t working. It slowly rises. Sorry to hear you’re having so much trouble, Staci. I admire your persistence! Are you using new, active yeast dissolved in warm water as your catalyst, and a bottle with a relatively small opening? I just googled ‘troubleshooting elephants toothpaste’ and found this info. Have a scan and see if anything helps? I hope he or she enjoys it, Kerri! This looks so wonderful, I have been searching for things to do at our preschool and I think the spectacular reaction with the sensory play possibilities after are too good a combination to pass up! I have reasearched the 20vol/6% Hydrogen Peroxide to try to be sure it is as safe as can be for our guys and looking at the CLEAPSS (student safety data sheets available) it gives advice on handling it. I think as long as there is adult supervision (obvisously ;)) and their hands are washed imediately after they’ve played with it it ought to be all fine, though I’m going to test it out on my, 5, 9 & 11 year olds first ;). Thank you for such amazing ideas! Thank you so much for your kind words and your enthusastic comment! I certainly would have no hesitation doing this with my pre-schooler nephew. In fact, I should probably get him over to do it soon. 🙂 I hope your children have fun being guinea pigs! 🙂 I always keep a supply of hydrogen peroxide in these days! Your older children might be interested in testing the gas produced with a glowing splint (or coffee stirrer), like we did – there’s a short video of my 11 year old doing it at the end of this post. It’s v cool watching the splint relight in the oxygen! What an excellent idea! Thanks Lucinda! Jenny, I’m sorry to hear nothing happened when you tried this. The same thing has happened to us with a few other experiments we’ve tried – I know how disappointing it can be! All I can suggest is to try again, maybe with a different brand of hydrogen peroxide. (Perhaps yours was from a faulty batch?) We’ve done this quite a few times now (and my kids demonstrated it at a science fair) and the size of the reaction varies but we never get nothing. Good luck, and please do come back and let me know if you do get it to work! We also used rapid rise instant yeast .. Nothing was happening at first .. Then , we shook the bottle a tad and squeezed it!! Then the fun happened!! Fantastic! I’m so pleased to hear the fun worked for you, Meg. 🙂 Thank you for stopping to leave a comment! Wow I love this!!! The hubby would love to do this with the girls! Good point. 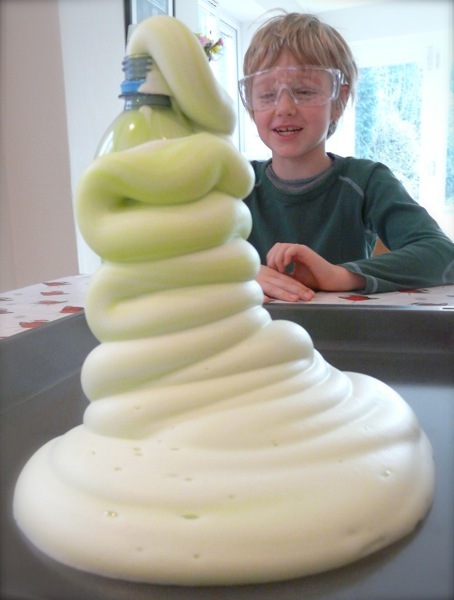 You’d have to scale up all the quantities to make elephant toothpaste on such a grand scale! That looks brilliant! 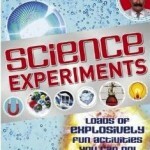 We have ‘Science Saturdays’ where we do different experiments as my daughter is fascinated by science. Primary School doesn’t really do a great job covering it, but I also love science, so we do our own experiments. This one has to be tried! Did you get the hydrogen peroxide from the chemist? Never seen it in a bottle like that, but then, I’ve never been looking or it before. Have everything else in the cupboard. Thanks, Sharon – I love this too, it’s so fun, easy and safe! I love the sound of your Science Saturdays. We’ve made ‘elephant toothpaste’ a few times and I’ve bought the hydrogen peroxide from both Amazon and at the local chemist. Have fun! What other experiments have you enjoyed? I’ve listed some of our other favourites at the bottom of my post about squishy circuits. Fantastic experiment, but before we start, what happens to it afterwards? Can the kids play with it or does it dissolve? Yvonne, the foam lasts quite a while – until you throw it away, I think – so yes, kids can dig in and play. Mine did! Thank you so much for the directions and recipe. My son has been wanting to do these types of experiments and I just didn’t want to go in blind. We tried twice with differerent propotions but we did not succeed. Oh no! Sorry to hear that. 🙁 I wonder what went wrong? Can we still use that ‘elephant toothpaste’ for washing? my son is doing a project and needs to create snow capped mountains (for skiing) . can this somehow be adapted to look like a mountain? once the recipe is ‘activated’ , does it last long and harden for long term?